For many of us, shopping doesn’t come easily. There are a seemingly infinite number of stores to go to, and on top of that, there are multiple styles within each store. Adding to the trouble and pain of it all is the fact that we’re college students, meaning that the little spending money we have usually goes towards paying rent or buying books for class. To help diminish the stress from your next shopping trip, I’ve constructed a list of tips to pick out clothes and budget wisely. Eliminate seasonality. You shouldn’t be looking for clothes that are specific to spring or fall, for example. Rather, look for pieces that you can wear year-round in order to get more bang for your buck. For instance, if you’re looking for a maxi dress, buy it in a darker hue so that you can fit it into your fall wardrobe after summer ends. Similarly for guys, when you’re buying shorts try to stay away from too many pastels and buy more tan and brown neutrals so you can whip them out when a fall heat wave rolls through. Shoot for quality over quantity. Let’s face it – it’s easy to get sucked into the world of “fast fashion” at stores like Brandy Melville and Forever 21. This means that the clothes are made cheap and quickly, so they have a shorter lifespan before they begin to look ratty and messy. Instead of buying five basic tanks for $25, invest in a more mature silhouette that will last years beyond your “fast fashion” pieces. You will be saving money in the long run. Look for online stores with free returns. Shopping online can be a breeze, but it is very difficult to determine what size will fit you best when you’re not able to try a garment on. If the online store allows free returns with reimbursement to the original form of payment, buy the two sizes that you’re on the fence about, try them both on once they arrive, and return the one that doesn’t fit. That way you’re able to ensure that you bought the correct size. Sleep on it. No one said shopping had to be a rush! If you can’t decide whether to buy an item or not, go home and sleep on it for a few nights. If you still have the strong desire to buy it, then go get it! At that point you know that it wasn’t an impulsive purchase. Play the “over/under” game. This is a trick that I use every time I go shopping. First, look at a garment without looking at its price tag. Value the item yourself. That means that you’ll decide how much you think it should cost. Then look at the price tag. If it costs less than you were willing to pay for it, then buy it. If it’s more than you priced it at, then leave it on the rack. Make accessories work for your wardrobe. Buy accessories that add versatility to your clothing. The easiest way to change the same outfit is to spruce it up with a different necklace, scarf, or jacket. That way you’ll be able to make certain pieces work for different occasions, and it won’t look like you’re wearing the same outfit week after week. Thrift store culture has been booming in the Pacific Northwest for the past decade, and it has only been picking up speed. With the immense popularity of Macklemore and Ryan Lewis’s song “Thrift Shop,” secondhand clothing has had a rebirth that our generation is swallowing whole. The legacy of Kurt Cobain’s grunge style has been reworked and re-popularized by style icons like Rihanna, Cara Delevingne, Jared Leto, and the Olsen Twins. People are searching thrift stores high and low to find unique garments that aren’t coming out of cookie-cutter patterns created by corporate retail machines. The pieces they buy have a life to them that regular retail stores can’t replicate. Therefore, secondhand clothing tends to be cheaper, more worn-in, and funkier than what other retail stores are selling, making it especially appealing to college students. 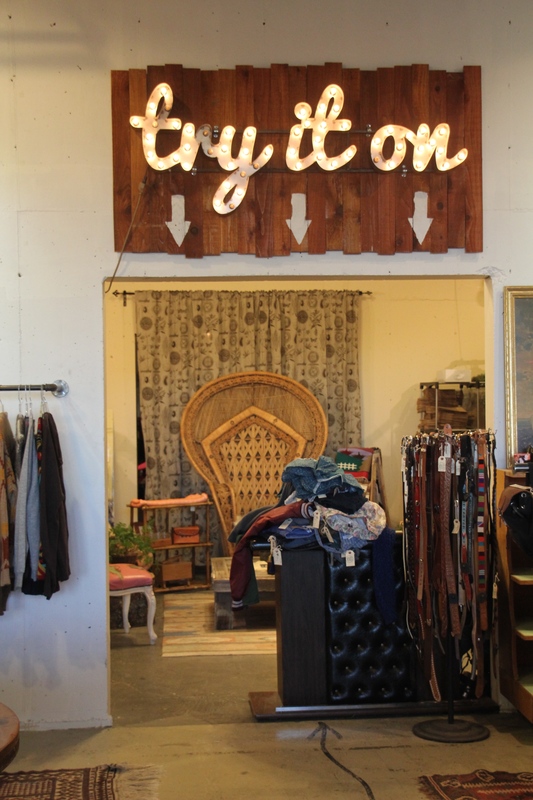 There are numerous, multiple, infinite thrift stores in Tacoma, but Urban X Change is my favorite hidden gem. When I walked into the store for the first time, there was a vibe about it that I had never felt while entering any other retail shop. It’s as if it presents a package of the Pacific Northwest lifestyle in terms of ease, accessibility and free spirit. The clothing perfectly exemplifies the funky style of Tacoma, appealing to both fashion and comfort. 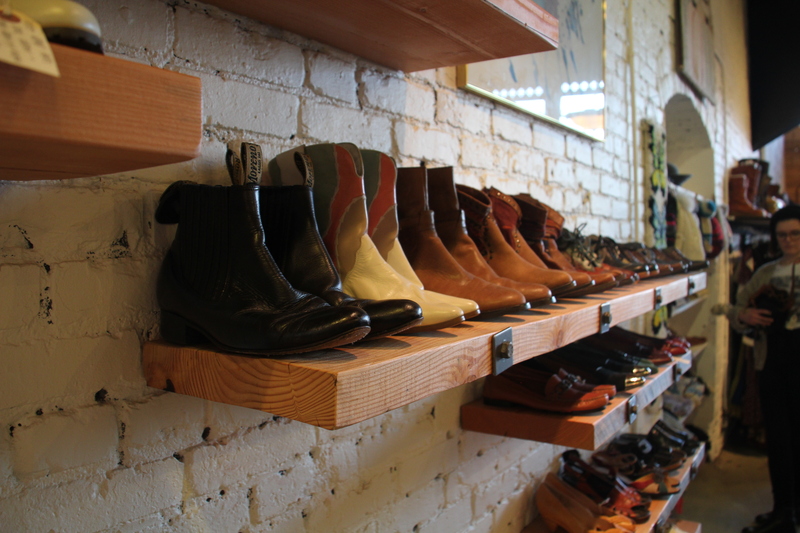 There are shoes and boots lining the opposing walls of the Men’s and Women’s sections, and peeks of butter-soft Pendleton cloth emerging from the rows of winter wear. To say that it was a love affair would be an understatement. Located in downtown Tacoma on Pacific Avenue, UXC has been around for ten years. In fall of 2013, married couple Nick and Brooke Casanova took on the store, putting their own personal touch on Tacoma fashion. I had the opportunity to talk with them about the store, the way it operates and its bright future. “You would be amazed about how many calls we get about people asking if we’re selling mattresses and items like that because we’re classified along with other thrift stores. 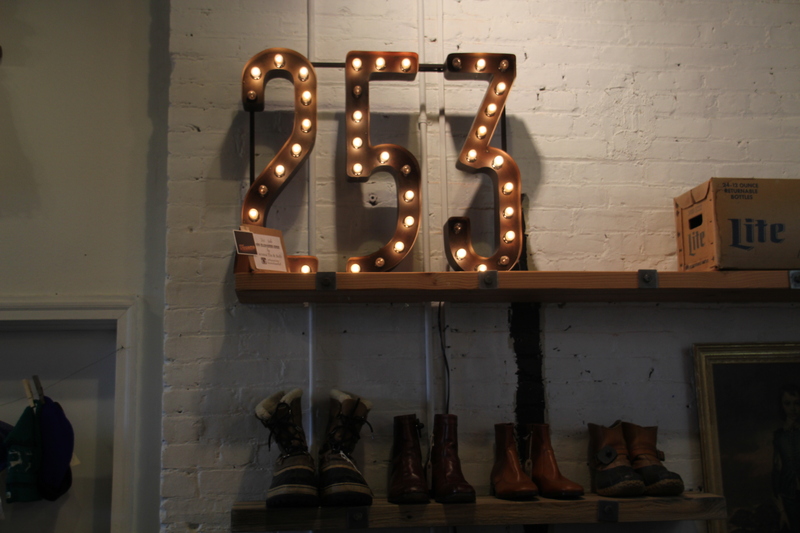 So we wouldn’t call ourselves a thrift store, but more of a secondhand boutique,” said Brooke. “We’re a creative shop that focuses on vintage and modern goods and welcomes community to try and stay ahead of the game as far as product goes,” said Nick. Currently, Urban Outfitters, Anthropologie, Free People and Buffalo Exchange are the frontrunners in grungy, bohemian style. They have had a lot of success in appealing to a generation of funky fashionistas, for a high price. Nick pointed out that none of these stores exist in Tacoma, so it is the goal of UXC to combine these four styles into one and package it for the Tacoma community. “We want people to know that we’re selling items strategically in order to appeal to them, so they don’t have to go to the mall when they want Clarks desert boots or a vintage maxi dress. We want them to think of us first,” Brooke and Nick said. Brooke and Nick love looking through the items that customers bring in, because it constantly reshapes the type of merchandise that the store is selling. They usually get a lot of garments in from the 1970s, 1980s and 1990s and some from ‘50s and ‘60s. “Not too long ago we had a woman come in with around 15 vintage gunny sack dresses. That was definitely one of my favorite buys. They didn’t stay in the store very long because customers immediately bought them,” said Brooke. The store gets about 6-15 sellers everyday, but they hope to expand their selling population to UW Tacoma and UPS students. The Casanovas find it of utmost importance to foster a sense of community at UXC. They sell locally made jewelry in the store, creating partnerships with Tacoma artisans. They also hope to add more bustle to Pacific Avenue in order to create cooperative retail advantage for neighboring stores, restaurants, and coffee shops. Pac Ave is a major street in downtown Tacoma, but it lacks the foot traffic that many big cities have, making visitors less likely to pop into new places. Urban X Change has a very exciting future ahead of it. Further collaboration with the Tacoma community will only bring growth and success. Check out Urban X Change’s Instagram account (urbanxchangetacoma) and Etsy shop, and head down to Pacific Avenue to see what they have in store! This past week, the sun was shining and spirits were high! To celebrate this change in weather, I tracked down Loggers who like to keep it fresh with their style. These students gave me a tidbit on their own personal style and how they represent it through their clothing choices. Keep an eye out for more campus style segments! Fashion comes in all shapes and sizes – even when that size is 11.5 inches tall. Since 1959, Barbie has been a representation of a stylish, fashion-oriented woman. Her infinite number of outfits even mirror the shifts and changes of women during the latter half of the 20th century, marking Barbie as America’s most famous figurine. Pamela Thompson, former Betsey Johnson and Heatherette head designer (who is currently a collaborator with Anna Sui), created Tiny Frock Shop in order to bring designer style to Barbie owners and collectors around the globe. The online shop operates as a secondhand resale store for Barbie outfits. From menswear (for Ken, of course), bridal gowns, accessories, home life, and pre-loved dolls, they sell it all! Thompson credits her 6-year-old daughter, Lily, with the tile of CEO, which further shows the cross-generational adoration for Barbie. Here’s a tidbit from Lily from the store’s website: “Hi…I am Lily. I am 6 and the CEO of Tiny Frock Shop. I know a lot about dolls. I love Barbies, milk, profit margins, the colors pink and black, TPS reports, sparkly dresses, punctuality, team players, chocolate and kitties so so much.” How ridiculously adorable is that!? Check out Tiny Frock Shop to get a look at these cool and sophisticated teeny-tiny outfits! Yes, the best way to celebrate your birthday is at Disneyland with your family! Feeling so lucky to kick off 26 with these people. Daddio - I have a theory that you’re an alien who was put on this earth to bring unconditional joy to everyone’s lives. You’ve taught me how to hit the crap out of my 7-iron, what good wine should taste like, and to not sweat the small stuff. Also thanks for letting me call you weekly to ask if my food is still safe to eat past the expiration date. Happy birthday - I love you!